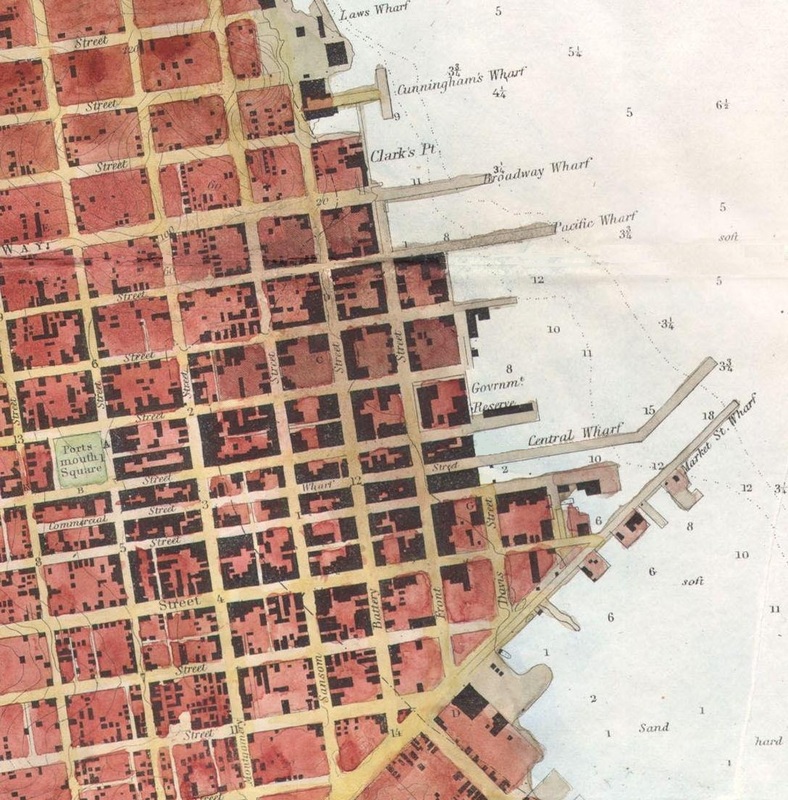 Among the handful of passengers who disembarked at San Francisco that day was a man named Isaac Pear. During his year-long stay, Pear enclosed at least three menus with letters he mailed to relatives back home. 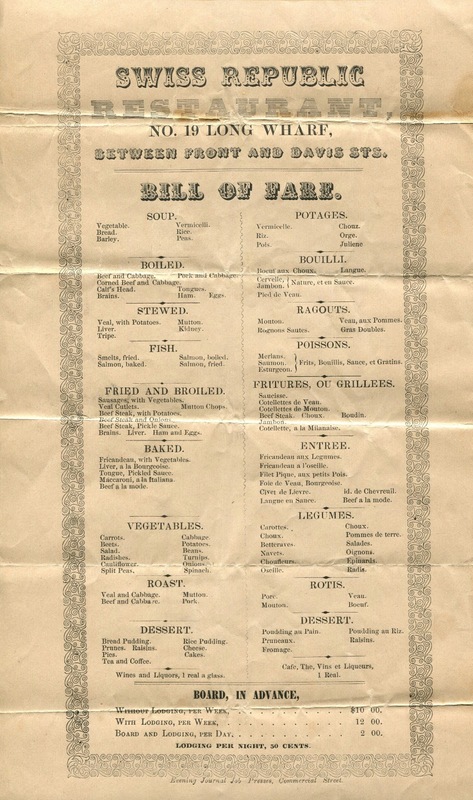 The lengthy format of these menus seems to express the abundance of food that was then being supplied by a long, well-established supply chain. Although prices had fallen from their peak four years earlier, the cost of food remained high, with local products commanding the highest premiums. 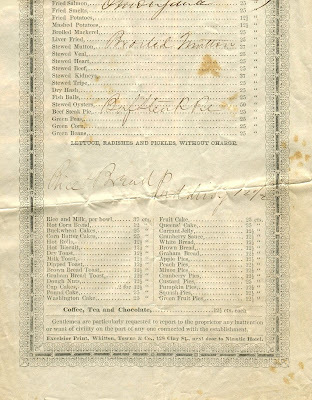 Adjusting for inflation, one dollar in 1849 is equivalent to approximately $28.00 today. 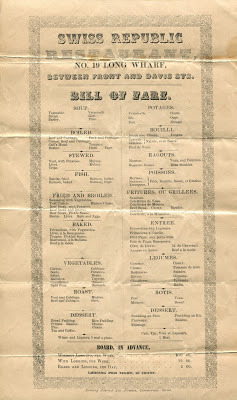 Another way to put the cost of food into perspective is to compare it to the price of gold which was then $19 an ounce. Forty-niners Carlo Scalmanini and Baptiste Frapoli went to the gold fields when they first arrived, but soon returned to the city to open the Swiss Republic Restaurant at 19 Long Wharf. 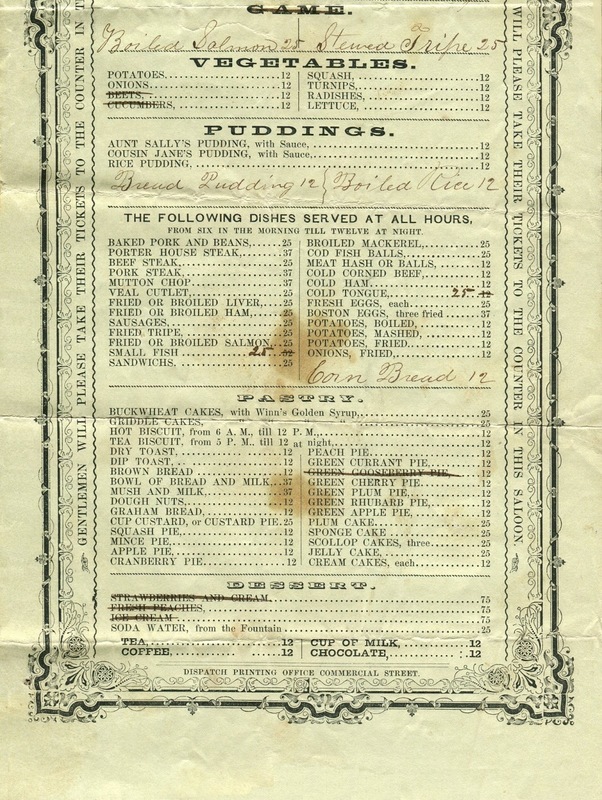 Many eateries near the landing rented rooms, as shown by the rates for room and board on this table d’hôte menu. The owners of the Swiss Republic were born in Ticino, the southernmost canton of Switzerland. Fellow countryman Cyrus Delmonico, nephew of the famous restaurateurs in New York, also opened an eatery in San Francisco at this time. The discovery of gold attracted thousands of Ticinesi like Delmonico, Scalmanini, and Frapoli to California, creating one of the largest Italian Swiss communities in the world. When M. L. Winn arrived in 1849, he made candy and sold it on the streets, chanting: “Here is your California candy! 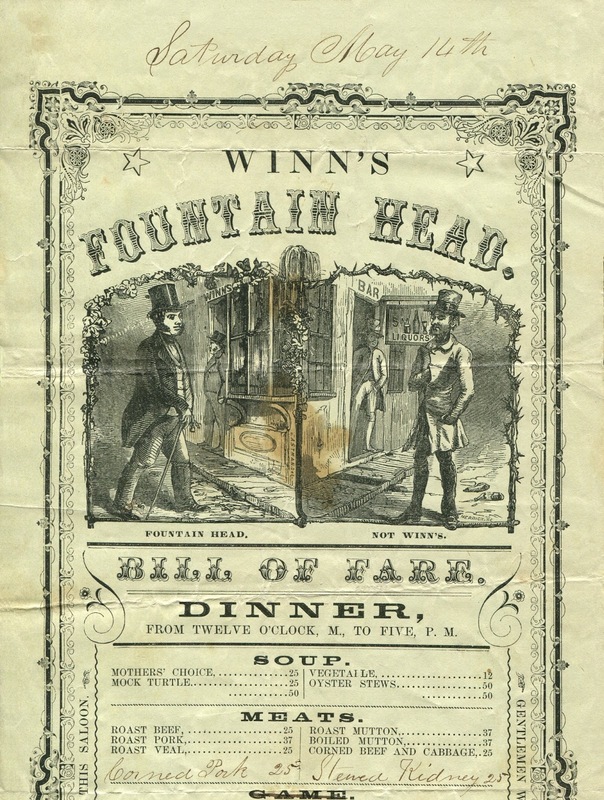 It has neither come ‘round the Horn nor across the Isthmus, but is made in your city…”7 Winn established a temperance restaurant on Long Wharf named the Fountain Head, followed by the “Branch” on the corner of Montgomery and Washington streets, and finally the “Extension” on Clay Street. Although these locations reportedly did a booming business, friends advised him that he would do even better if he sold alcohol. Still, Winn remained steadfast in his refusal to sell intoxicating beverages. Temperance advocacy gained national momentum in 1851, when Maine outlawed the sale and consumption of alcohol; eleven other states and territories eventually passed similar statutes. As a social and political movement, temperance permeated American culture, even in a hard-drinking city like San Francisco. 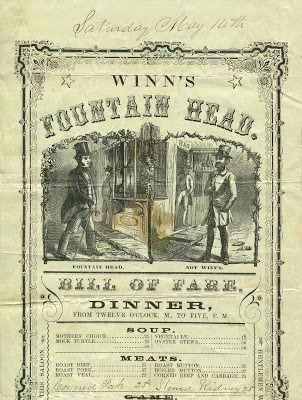 The temperance theme is reflected on the dinner menu below by the cartoon comparing a well-dressed gentleman at the Fountain Head to a disheveled man entering a bar labeled “Not Winn’s.” The antebellum spirit of this menu is also conveyed by the puddings named after “Aunt Sally” and “Cousin Jane.” The buckwheat pancakes are served with Winn’s Golden Syrup, a product that he also sold on the retail market. Interestingly, three eggs from Boston cost 37 cents, half the price of four years earlier. Prices were much lower, but everything was still relatively expensive. In his Memoirs, Grant recalled that “the prices for all kinds of supplies were so high on the Pacific coast from 1849 until at least 1853—that it would have been impossible for officers of the army to exist upon their pay…” In fact, Grant’s future commander, William Tecumseh Sherman, resigned his captaincy in 1853 to become a bank manager in San Francisco. Despite the high prices, the people living in San Francisco generally made enough money to eat out all the time; the restaurants were packed. Winn claimed he sold a hundred and twenty-five dozen eggs per day that year. Lower prices required smaller units of currency. However, before the discovery of gold, the federal Mint did not coin enough precious metal, prompting the use of foreign coins throughout the country. 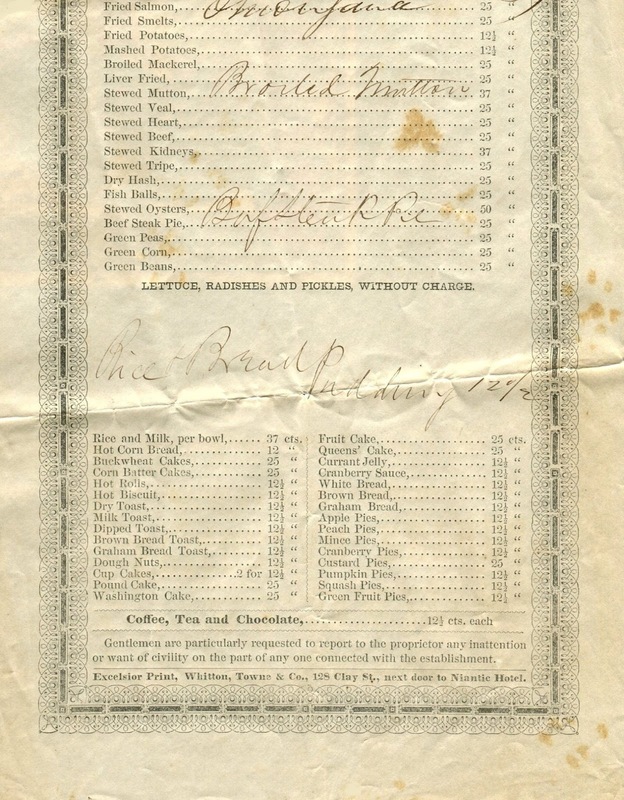 The 12- and 12½-cent increments on à la carte menus of the era reflected the widespread use of the Spanish real, then valued at an eighth of a dollar. Dubbed a “bit” in the West, the real was called a “ninepence” in New England, a “shilling” in New York, and a “levy” in Virginia, Maryland, and Pennsylvania. Other coins in circulation included Russian kopecks, Dutch six-dollar pieces, and French and English specie, as well as silver dollars, halves, quarters, eighths, and sixteenths minted in Mexico and the South American republics.8 A branch of the Mint was established in San Francisco in 1854, and three years later, the U.S. government banned the use of all foreign coins. Once proclaimed the “Ice Cream Maker Plenipotentiary,” Winn could produce enough ice cream for 1,500 servings per day. 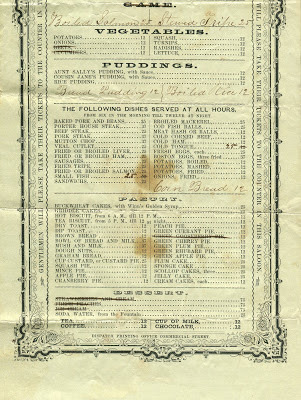 However, on Saturday, May 16 (the date inscribed on the menu above), demand exceeded supply—ice cream is crossed out, along with the strawberries, the green gooseberry pie, and the fresh peaches with cream. 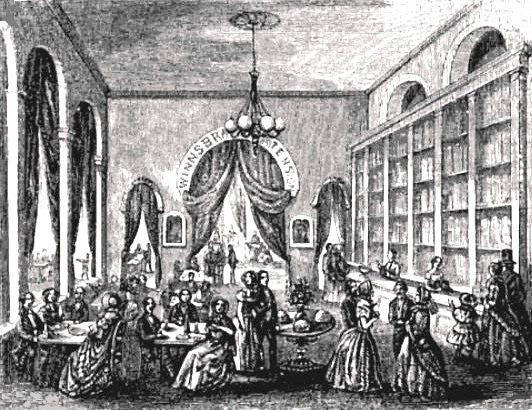 In fact, Winn’s Branch was known as a ladies ice cream saloon, although the social milieu at this fancy establishment was different than at similar places in other American cities. 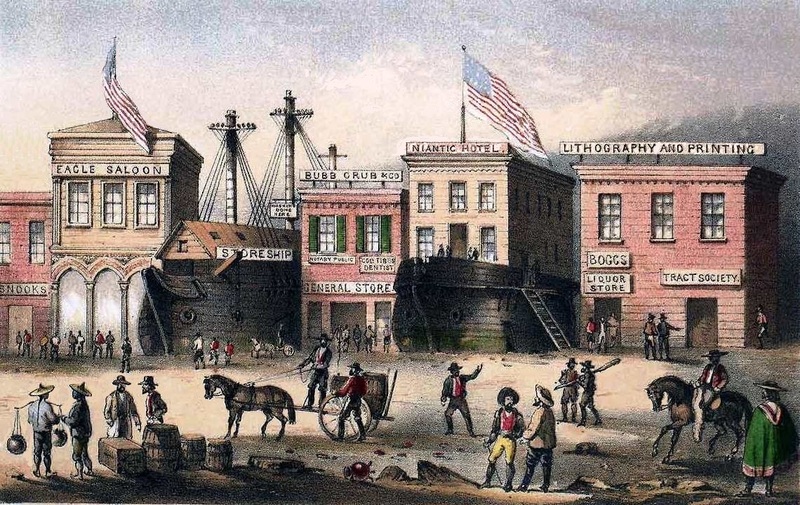 During the Gold Rush, when women represented a very small percentage of the population, prostitutes came to San Francisco in droves from all over the world, including France, Germany, Australia, Mexico, China, and various parts of the United States. In other words, they came from the same places as the other fortune seekers.9 After almost instantly becoming a multinational city, comprising mostly bachelors in their 20s and 30s, “no one set of mores held sway” in the first few years.10 The women of easy virtue openly mingled with men at all levels of the community. Some even became leaders in the upper echelons of society, until the city’s permissive attitudes began to change at about this time. 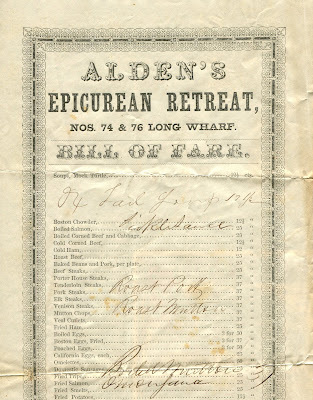 The menu for Alden’s Epicurean Retreat was made by the Excelsior Print Company, situated next door to the picturesque Niantic Hotel that had been built in a beached whaling vessel.11, 12 In addition to fish and game dishes sourced from the West, such as salmon, venison, and elk steaks, the menu below offers three Boston eggs for 37 cents, the same price as Winn’s, reflecting the competitive dynamics in a city filled with saloons, restaurants, and hotels. 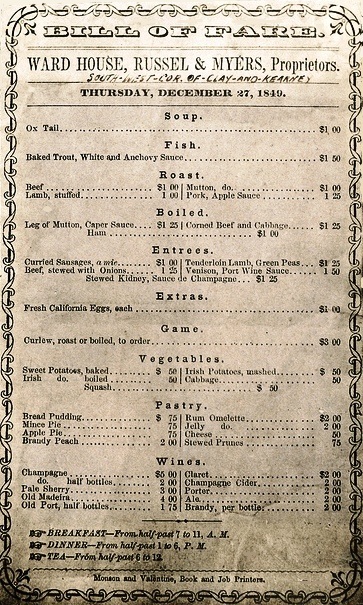 Although the California eggs on these menus were presumably laid by chickens, the high prices attracted another type of fresh eggs to the local markets. Two to three times larger, with fiery red yokes, these were the speckled eggs of the common murre, a seabird that nests on the rocky cliffs of the Farallon Islands, situated 27 miles west of the Golden Gate. 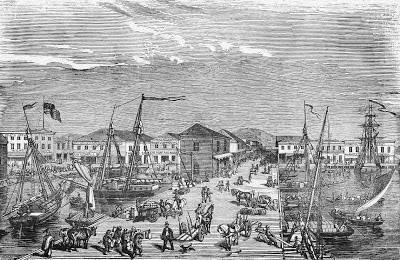 By 1853, the so-called “eggers” had snatched millions of eggs from the high-density colonies on these fecund isles. Then at its peak, the lucrative trade in murre eggs continued into the 1890s. Despite careful protection over the last hundred years, the population of these seabirds has yet to recover. 1. Golden Eagle was launched at Medford, Massachusetts on 9 November 1852. 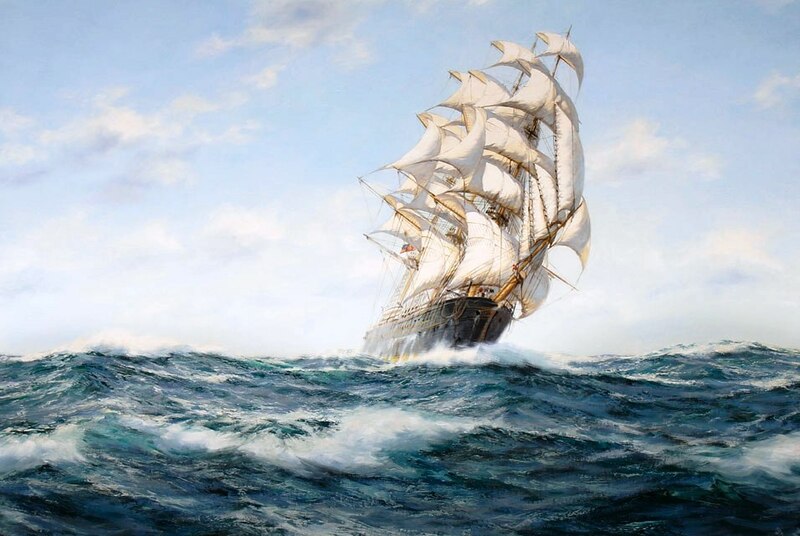 Featuring a figurehead of a gilded eagle on the wing, the ship was an extreme clipper with a displacement of 1121 tons, measuring 192 x 36 x 22 feet (length x beam x depth of hold). 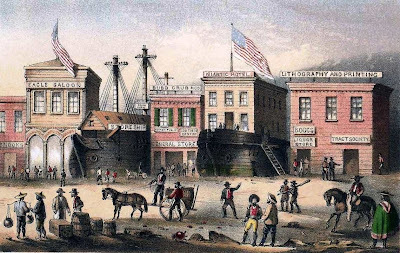 The ship made eight voyages from the East Coast around the Horn to San Francisco; the first out of Boston, the others from New York. On 21 February 1863, during the homeward leg of the last of these voyages, she was attacked and burned by the Confederate commerce raider C.S.S. Alabama. 3. First built in 1849 in the tidal flats of Yerba Buena Cove, the Central Wharf later became known as Long Wharf, and eventually as the Commercial Street Wharf. 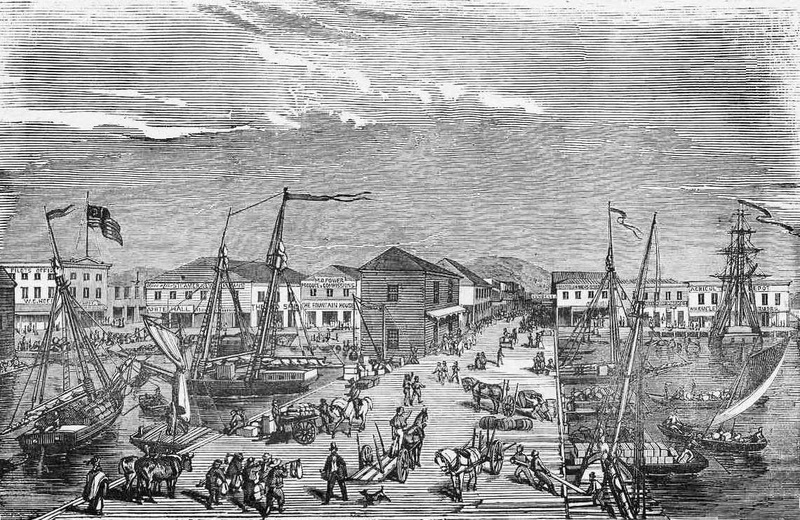 By 1853, the huge forest of masts from an abandoned fleet of vessels was used to the fill in the cove, and the wharf was extended into the Bay. 4. Ulysses S. Grant, Personal Memoirs of U.S. Grant, Chapter XIV, 1885. 5. 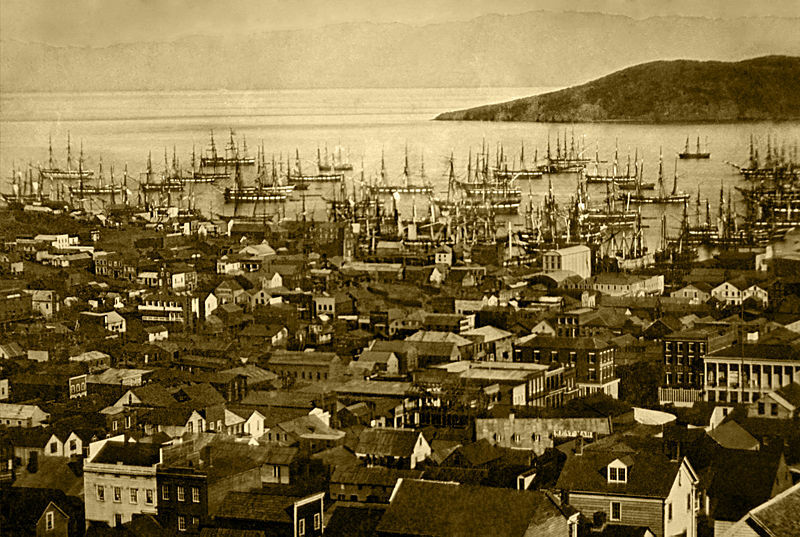 Grant returned to San Francisco again in 1854, after resigning his captaincy at Fort Humboldt. He stayed at the What Cheer House, a temperance hotel at Leidesdorff and Sacramento streets, just around the corner from these restaurants. 6. Andrew Beahrs, "Slush on the Mizzentops, Butter in the Hold," Gastronomica, Winter 2012, p. 37-45. 7. Frank Soulé, The annals of San Francisco; containing a summary of the history of ... California, New York, 1855. 8. Jack Larkin, The Reshaping of Everyday Life: 1790-1840, 2010. 11. 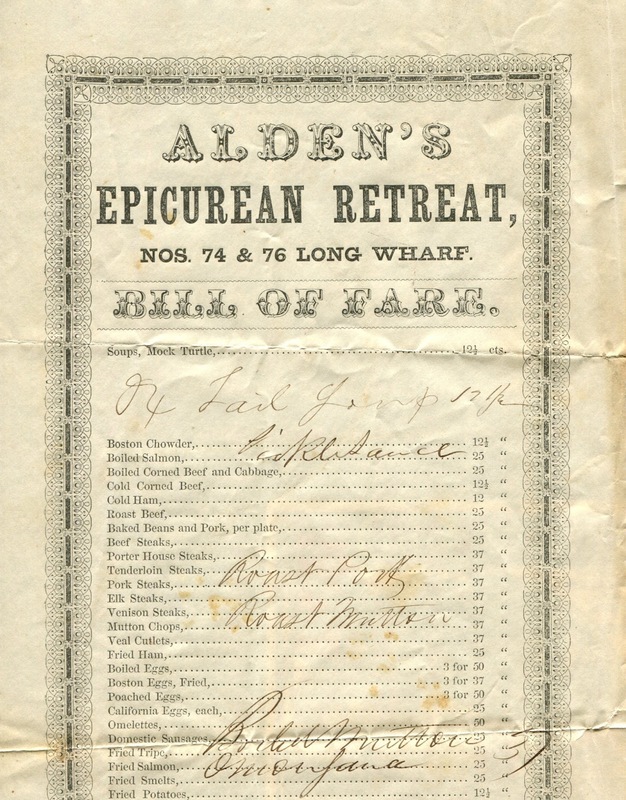 Alden’s Epicurean Retreat also operated a Branch at 81 Sansome Street. 12. 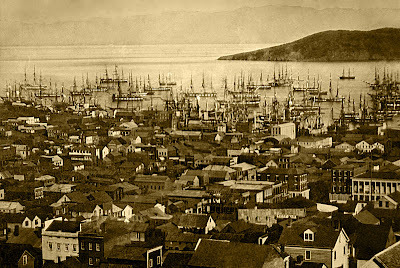 After carrying 248 gold-seekers from Panama to San Francisco, the whaling vessel Niantic was beached near the corner of Clay and Sansome Streets in 1849, when the shoreline ran along Montgomery Street. The ship was converted into a hotel, using the hull as a warehouse with doorways on the sides. The fire of 3 May 1851 destroyed all but the submerged hulk, which became the foundation for another Niantic Hotel that stood until 1872. 13. Weekly California Farmer, an agricultural paper, began publication on 16 January 1853. 14. There were many ways to make money during the Gold Rush. The trick was not to lose it in the saloons, gambling halls, and houses of ill repute. By the 1870s, restaurateur Solomon E. Alden was listed in the city directory as a bank director and farmer, living on a 612-acre estate comprising much of the Temescal area of Alameda County. Henry, Great research on these three prize menus. I love how you used eggs to tie them together. I am still reeling at the thought of a 4 month old egg... yuk. Those Murre eggs are just beautiful, how horrid that their colonies were decimated. At least then, people didn't really know better. Today we do it knowing that it's wrong but doing it anyway. Makes me sad. Just discovered your blog thanks to 2 Nerdy History Girls' "Breakfast Links" -- and what a delicious find it is! Thanks for making history not merely accessable but fascinating and entertaining as well. One might even call it "mouth-watering" -- I'm having the strongest craving for scrambled eggs! Thanks for bringing history alive. I knew the Aldens had a farm in Oakland; I didn't know they had a restaurant in San Francisco. I think that makes them one of pioneers in the farm-to-table movement, doesn't it?